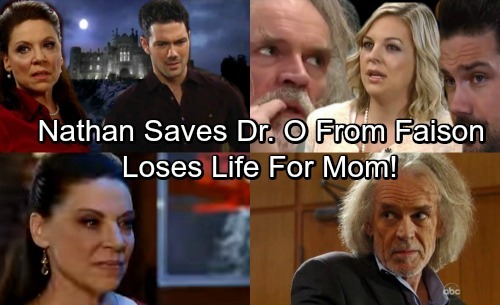 General Hospital (GH) spoilers tease that Dr. Obrecht’s (Kathleen Gati) fears will grow stronger. She’s done everything in her power to keep Nathan (Ryan Paevey) safe, including giving him up as a child and keeping him in the dark about his father. However, Dr. O’s secret came out and now major drama’s brewing. Faison (Anders Hove) is Nathan’s father, so there’s bound to be trouble eventually. Nathan is determined to find Faison and put an end to this threat against his family. As long as Faison has his freedom, he could spark danger for Nathan, Maxie (Kirsten Storms) and their baby. GH spoilers state that Nathan and Lulu (Emme Rylan) will try to locate Faison together. They’ll pass along any useful hints as their mission heats up, but they won’t have a lot to go on. Lulu will just wish she could get some solid info, but Dante (Dominic Zamprogna) will be happy she’s hitting dead ends. He’ll hope Lulu will give up her fight sooner or later. Lulu will hold out hope as long as possible, but Nathan will face pressure to back down. Maxie will continue to have a bad feeling about all of this. General Hospital spoilers reveal that Maxie will push Nathan to go into hiding with her. She’ll feel like finding Faison will only enrage the beast and put targets on their backs. Maxie will seek assistance from Mac (John J. York), so she may succeed in winning Nathan over on this one. On January 23, Dr. Obecht will have to face the terror in her past. She’ll be forced to endure the consequences of keeping perilous secrets. Will Faison learn the truth and unleash his wrath? Will Dr. Obrecht decide to speak with Faison in person and deliver a heartfelt plea? Dr. O may beg Faison to leave Nathan alone. She would do anything for her son, which includes risking her life. Of course, that would set up a potential rescue effort for Dr. Obrecht. There’s still some General Hospital buzz out there about Ryan Paevey’s possible exit. If the show decides to kill Nathan off, this would be a great way to do it. Dr. O fought so hard to protect Nathan, but she could be the one who costs him his life in the end. He could die trying to save his mother from Faison’s fury. Do you think Nathan can survive the fierce battle ahead? We’ll give you updates as other GH news comes in. Stay tuned to the ABC soap and don’t forget to check CDL often for the latest General Hospital spoilers, updates and news.